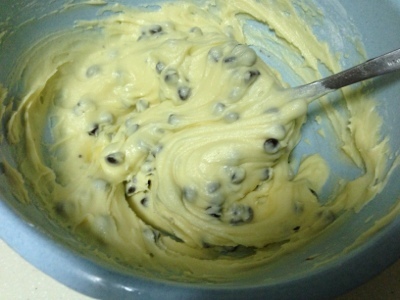 This is the the perfect "Lazyman" baking cookies... 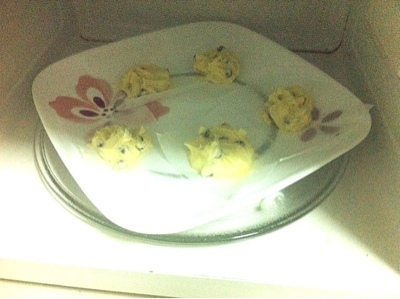 Baked using normal Microwave Oven. The cookies are cooked from the inside hence they look pale (unlike oven baked cookies). 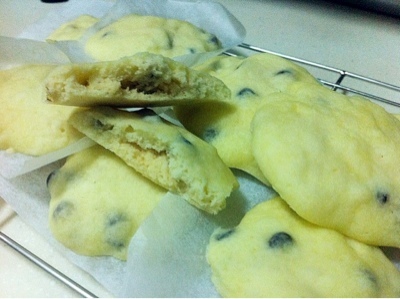 The taste resembles English shortcakes and its very buttery. 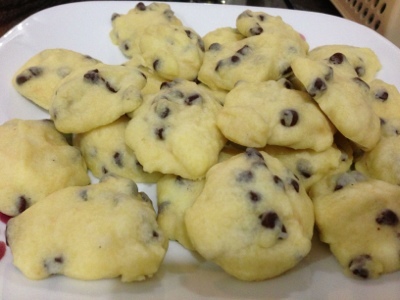 The chocolate chips provide crunchiness and contrast well with the shortcake texture. These are my daughters' favourite! They always wait by the microwave oven as the baking time is only about 2 to 3 mins and they eat it as soon as it slightly cooled down. I like to bake this shortly after dinner on weekdays as its easy and fast, best of all, minimum cleanups! We have lots of fun making this cookies together. Those look so good, I'm definitely going to try them with my kids. Thank you! I am a full time working mum who loves to bake and cook occasionally. I enjoy handicrafts and loves making doll clothes. My secret wish is to open an Art school that teaches children’s art and craft. I have a supportive husband and three kids, love of my life.